Relationship is such a basic notion to our existences that we completely take it for granted and don’t really think about it. It’s like the air; it’s just there, a given that we don’t think about except when we can’t breathe. Relationship is basic to who we are as human beings. When I was an undergraduate, my sociology professor asked the class for their opinion about whether human beings were social animals; it was a question in dispute not that long ago. The best proof he could offer for the social nature of the human person was the question of whether you had ever sat on a warm toilet seat. Some of the most important things to being human are our ability to create meaning, form emotional reactions, organize memory, and communicate, and science has discovered that the most basic wiring of our brains uses relationship systems and structures to do these very basic human things. If you think about the human body, its very design assumes that there is more than just me; the very structures of our bodies assume there are other people. There is no way to perpetuate the species without two human beings. We help each other in innumerable ways. Children depend on relationships with their parents for food, shelter, and clothing. Students depend on relationships with their teachers and tutors for the transfer of knowledge. Companies depend on relationships between team players to get parts of projects finished. As believers, I don’t think it’s any accident that relationship is at the root of what it means to be a human. Today the Church celebrates Trinity Sunday, a day when we as Church pause in a special way to reflect on the internal life of God. The doctrine of the Trinity in a nutshell is this: God is one and three at the same time and includes the Father, the Son, and the Holy Spirit. The Father is not the Son or the Spirit. The Son is not the Father or Spirit. And the Spirit is not the Father and Son. God is Father, Son, and Spirit all at once but only one being. In other words, relationship is the very nature of God. It is written in Genesis that we are created in the image and likeness of God. Genesis 1:26 says, “Then God said, ‘Let us make mankind in our image, to be like us.’” (Just as a little aside, note that God refers to Godself with first person plural pronouns.) If we start with the human person, and we acknowledge that relationship is fundamental to who we are, and we believe we are created in God’s image, it ought not to be surprising to us that if we exist in a fundamental way in relationship, our God is fundamentally—at the very root—a relational being. Today’s gospel takes place in Galilee after the resurrection of the Lord. In it, Jesus tells the disciples to go out and preach the Good News, baptizing people in the name of the Father, and of the Son, and of the Holy Spirit. This is a remarkable passage, because it so incontrovertibly ancient. Some people deny the Trinity saying it was a relatively late development in the theology of the Church, but that is simply not true. The passage we read today occurs in the most ancient existing manuscript of Matthew’s gospel. The idea that God was somehow a relational being goes back to the most ancient experience of the Christian community. Today’s gospel is also relevant to Trinity Sunday beyond the mention of the persons of the Trinity. In it, the resurrected Jesus is telling us what we are to do if we are to be Christians. If we to be Christian, we must live in mission. We are charged to live out our Christian life as people who carry the gospel to other people. We are charged to live out our Christian life as people who inaugurate other people into the most basic characteristics of God’s life—God’s Trinitarian nature. In other words, to be a Christian, like to be a human being, requires us to reach out to other people, that is, it requires us to live in relationship with each other, just as God lives in relationship with God’s own self. The concept of “covenants” has been at the core of both Jewish and Christian faiths from very early on in history. Such covenant are usually seen as agreements between God and the covenanted party. The first covenant was made with Adam and Eve which was broken when they ate of the fruit of the tree, and yet there was a promise of God that the serpent would be crushed. The second covenant was with Noah and its conditions involved blood. God said he would never destroy the world again by flood, and they we’re never to drink the blood of animals or shed human blood. As a sign he sent the rainbow for them to remember the covenant. A third covenant was made with Abram in which God promised land and posterity. The condition of this promise was that they be circumcised – blood again was involved. Following this was the Mosaic covenant where God promised that the Israelites would be God’s chosen ones with a Promised land as long as they kept God’s laws and the Ten commandments. The sign of this was the passover which again involved blood. The blood of the Passover lamb was spread on the doorposts so that the angel of death would not visit their homes. Afterwards, as we read today, Moses took the blood from the offerings and splashed the altar, and then splashed it on the people as a sign of the blood covenant they had made with God. (Aren’t you glad we only use water in the New Testament! Could be kind of messy otherwise!). The fifth covenant with the Jews was made with King David who promised David that he would become a Father to the Jewish people, but a father who would use the rod on his children to discipline them if necessary – again, some blood involvement. The last of the Old Testament covenants was made to the prophet Jeremiah when God promises that his Law would not just be on stone but would be written on the hearts of his people, and all who believed in their hearts would become the new chosen. In the New Testament we see this last covenant fulfilled in the life of God’s son, Jesus. That we have become the new chosen who believe in Jesus and who carry Christ’s law in our hearts. As part of this covenant there is also blood as we see in the Gospel today when Jesus says “This is the blood of the covenant, which is poured out for many.” The sign of this covenant is the Eucharist which we celebrate today. I have chosen to talk about mostly the blood today since this feast day has expanded from being about Corpus Christi, the Body of Christ, to include the blood of Christ as well. And blood is not something most of us like to talk or even think about. It is of course, what gives our body life, and so may freak out when we are bleeding because blood is meant to stay inside. A few of us might like our steaks bloody rare, and many of us donate our blood to help others live. Bleeding is part of the life cycle of every woman which is part of the cycle which includes birth. We can’t really escape from all the images that blood brings – from horror movies to life-saving transfusions. While the horror type images might be part of the early Judaeo traditions with angels killing oldest children or beating children to discipline them – ideas that are part of a very immature age to our own, all of the more positive images fit in very nicely with the idea of the Eucharist. Indeed the Eucharist is a like a blood transfusion where Christ can actually be part of us, moving through our whole body as the blood that courses through it, and we can think of it as a donation of Jesus to help save lives. In actuality Jesus was talking about his own death and the blood that would be spilt a few days later which would bring about the salvation of the world – the sacrifice of the spotless lamb whose blood washes clean the sins of mankind and opening up heaven’s doors again, taking away the power of death. The second reading today from St. Paul uses the image of Christ, not Moses going into the Holy of Holies to be present with God, but he goes in not splashing blood as Moses did, but by having shed his own blood for us. Paul says that if sacrifices of goats and heifers purified people of their sins, how much more so would the blood of Christ permanently purify us from ours. And that is why, he says, Christ is the mediator, the go-between, of the new covenant between God and us who believe. When we dip or drink the consecrated wine today, we are using a symbol but we believe it is more than just a symbol – it is the actual body and blood of Christ. Just a symbol would not allow the transfusion to take place – and indeed we are transfused each week. It is God’s gift to help us through the week, to keep us focused on what is good and to help us love both neighbor and enemy. So as you take communion today, please think about what it means to have Christ within us, his blood coursing through our bodies with ours, his body, digested and giving us sustained life. It is good to look at the thing we celebrate each week but often take for granted, and it is Good News indeed that not only is Christ inside us, but we become part of Christ as well and share his body with all who are here! Another reason why Sunday Mass is so good for all of us! In the course of human history, humanity has advanced in its knowledge and understanding of its world and universe. Each century has seen advances and growth, none more than the last century. Yet, it seems as we grow in knowledge, we begin to understand that there is much we don’t know or understand. It would seem that our innate nature drives us to question, to seek answers, to know. Throughout the centuries it has served us well as we advanced in our living conditions. But, how much has our knowledge changed humanity and what we are? As people we are fragile and exhibit the strengths and weaknesses of our ancestors. Disagreements, wars, broken families and all the complexities of life remain after all the centuries before us. Sure Christ came and planted is way into the world and revealed the Spirit and his Father to the world. This God the Trinity is known to us, but, still today remains a mystery to us. 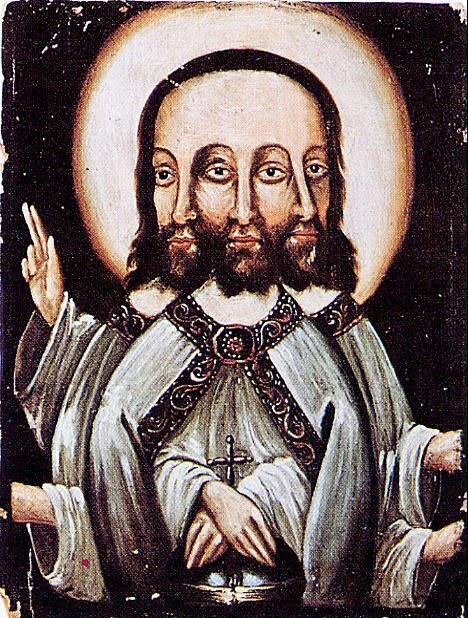 The early church argued and discussed the Trinity and tried to understand it as best they could. They gave us the Nicene Creed which contains our understanding even to today. To the Jews, God would not even give himself a name, saying only that “I am who I am” thus the name they called him “Yahweh” meaning “I am”. Today we call on God, Father, Son , Holy Spirit. He is one God, three persons. What we can’t understand, we seek to investigate to know, to unfold the mystery. Yet, what boldness we exhibit to try to find and explain God, one above and beyond and embracing all of creation, much of which we are only now beginning to see with our technology. What we see is our smallness and our life in a very small limitless universe. Yet, in our smallness, God comes to us, is a part our life, has a way to be united to him. 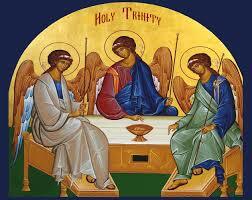 Thus as we consider, God, the Holy Trinity we should give thanks for his presence to us and for his being in our life. We are not past a time when Awe and Reverence are things of the past. We marvel at science and new things, but really we should remember that all is possible only because we are in God’s presence. Jewish worship from the earliest times was distinguished from the thought of other nations by the concept of only one God. In our reading today from the Book of Deuteronomy, Moses summarizes this Jewish belief and makes clear to all his people that there is only one God in heaven or on earth, and that there is no other. This was not the common belief of any of the other nations surrounding them, and so while it may be a concept ingrained in us in our society almost from birth, the cultural milieu in which they lived, the writings, the architecture, the art all around them suggested otherwise. It was so predominate, in fact, that the history of Israel seems to be the history of a people being tempted and succumbing to the belief in other gods. 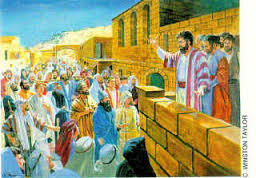 Moses tells his people that they are a blessed people, set apart. What other nation has been so honored to hear the voice of God, speaking out of fire. What other nation has been adopted by God, and proven to be so honored by signs, wonders, holy war, and terrifying displays of power as when they were led out of Egypt. Finally, this God has promised them a land, and all they need to do is keep his commandments, commandments which made them more civilized, more sensitive to others, and more holy. The Psalm today then speaks of the love of this God who has chosen us, and how our soul was created to wait for God, how God is our help and protector. This one true God has made himself known in his creation and in his commandments which raise us up, a similar idea to that which Moses spoke to his people. Since all of this was true and was the oldest tradition of Israel, imagine how upset traditional believing Jews must have felt with the new idea that Jesus was God. It upsets the whole apple cart! Yet, from the very beginnings of Christianity we see this belief that Jesus was indeed God made human. How is this possible? Then it is further complicated, perhaps, by the coming of the Holy Spirit who is also ascribed to be God. This Trinitarian concept has been around since the advent of Christianity despite the fact that it seems to abandon the earliest Jewish beliefs – and these are all Jews who were writing, remember! From earliest times theologians have tried to explain the concept of Trinity and the belief in the one true God. The bottom line: it is really not explainable! We can get glimpses of ideas about it, and theologians have come up with theories of three persons in one God – and we intact state those beliefs each week in our Creed, but they are really quite inadequate because they are beyond our total comprehension. The best we can probably do is exactly what the earliest disciples did – pray to one God through the terms which Jesus gave us: Father, Son and Holy Spirit. So what is important about this Feast today and important to our lives. Jesus once said: No one comes to the Father, except through him. I know that for centuries this has been interpreted as only Catholics get to heaven, but I don’t think it means that at all. I think it means that no one comes to an understanding of the God the Father, except by looking at Jesus and how he lived and what he did and what he said. Jesus is God made visible, so if we look at Jesus carefully and imitate his life to the best of our ability, we can move to be perfect as God is perfect.And what help do we have to do that? The Spirit, first described in the Bible as God’s breath or the wind over the waters, provides the impetus to know God. Again, our Psalm 33 today tells us that “Our soul waits for the Lord”. There is something deep inside each of us that wants to know God, that needs to know God, that aches to understand God and the meaning of life. To know God, we have to know Jesus whose humanity was not just a metaphor but an actuality. He is the example of the human who led a life of perfection. To imitate him is to know God, and it is the best we can do until we die and are able to know God intimately and perhaps even understand the great mysteries which elude us now. Let us pray that this week’s emphasis on the Trinity in our lives can bring us to living our lives on the road that leads to perfection through imitation of the God-man Jesus, and the through the inspiration and persistency of God’s spirit. And that is the Good News that was preached from the very beginning of the Christian era of the one, true God, the God of our fathers and mothers. In the news lately, we hear of multiple tornadoes touching down out west and wreaking havoc all over. Thankfully, I’ve never experienced one, but imagine the devastation that one can do as I am sure you’ve seen in pictures. 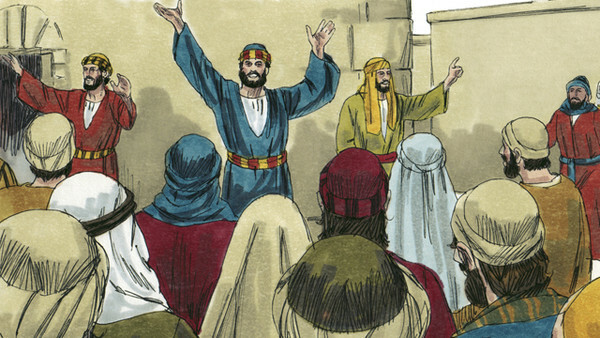 Getting back to Jerusalem on that Pentecost morning, there was a loud rush of wind that surrounded where the disciples were and in the busy crowed city everybody came to see what was happening. Inside was even more dramatic as fire appeared voe the apostles and disciples as the Holy Spirit came upon them. Imagine, they were so immersed, so overcome they actually couldn’t stand still. They burst out the door proclaiming, witnessing, all in different languages proclaiming Jesus to all in their own language. What a scene it must have been, all the different languages, people from different places hearing the word, the beginning of the church, a multilingual, multinational beginning. That beginning was Christocentric and remains so today. 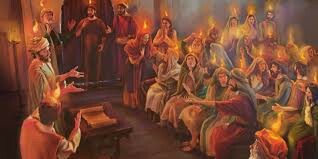 Clearly from Pentecost on, the church belonged to all who received and believed in the Spirit. The body of Christ has many parts and belongs to all, not one nation, not one language, but where Christ and his spirit breathe life into it. Each and everyone of us are servants of each other. It is in serving and loving one another that we fulfill the work of Christ. The Holy Spirit is Christ’s special gift to the church, who comes to each and every one of us at Baptism and completely immerses in us at confirmation. Sure, we have Christ with us and have his body and blood, but the spirit activates us to do the work of our faith. What is often forgotten is that the Spirit is the one who act and acts where He wants, not where we necessarily want or expect him to. How often in our human condition, do we forget or not even know or understand the whole picture of creation and God;s relationship to us. Just for example, the idea of forgiveness is difficult and unreasonable to many until it is for themselves. Pentecost began a journey for a new church and many believers. Our oneness is in Christ who recognizes all who gather in his name whether we do or not. Division and separation and infighting come out of humanity’s imperfection. Despite that imperfection, Christ calls and recognizes each of us and with the help of the Spirit brings us to Him. Last week I spoke about the promises that Jesus made before he left the Apostles and ascended. Those promises were all centre around the coming of the Spirit, a free gift of God to those faithful to Jesus, which would allow them to experience and continue to experience Jesus in their lives. In Acts today the coming of the Spirit is imaged by violent wind and the appearance of tongues of fire resting on each person. Whether that is a literal image or the best description they could come up with for what had happened, the important thing to note is that it had an affect. It changed the Apostles. The first major change that came about was the ability to speak or be understood in many different languages. It is not made clear whether they actually spoke those languages or the hearts just heard everything in their own languages. The concept of the spirit of God had been in Jewish writings and beliefs for many years. We read in the Psalm today: “when you send forth your spirit, they are created; and you renew the face of the earth.” If you remember back to Genesis it was the breath or spirit of God that originally blew over and created the earth. The Jews looked forward to a renewal of that original creation. The coming of the Holy Spirit took place on a Jewish holiday – the Feast of Shavuat or in Greek Pentecost, fifty days after Passover. It came to be associated with the giving of the Torah, the Law, to Moses. On that feast God put his spirit into the two tablets of the Law for his people to follow. 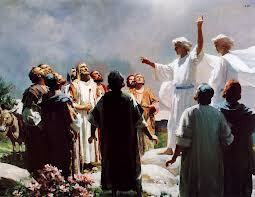 Now, at the Christian Pentecost, the Spirit comes into their hearts. There are comparisons with both comings. There was a theophany, or visible manifestation of God at Sinai and in the house at Pentecost. 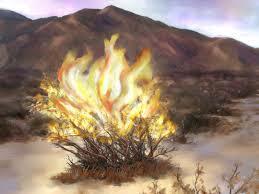 Both had fire – one in the form of a burning bush seen by all, the other as tongues of fire given individually. There were many people – non Jews present after both events, and both were accompanied by many tongues or voices. (See Stern, David H. Jewish New Testament Commentary, p.221). Another word for Torah is teaching and the Holy Spirit was sent also to teach. If Shavuat is considered the birth of Judaism, Pentecost is often considered the birth of Christianity. The Gospel reading today, however, gives a different interpretation of the coming of the Holy Spirit by having Jesus breathe on the apostles and saying, “Receive the Holy Spirit. If you forgive the sins of any, they are forgiven them; if you retain the sins of any, they are retained.” Most scholars consider this not the Pentecost experience but Jesus preparing them for that experience. John’s Gospel is often different from he Synoptics because his purposes are more theological, coming longer after the others. The purpose here seems to be one of preparation for the power that they were to receive. John does not concern himself with what happens to the Apostles as much as follow what happened to Christ. So he does not include Pentecost but ends with Jesus talking about coming again. St. Paul today also expounds about the Spirit. He says that without the Spirit, none of us would be able to believe in Jesus. We see the early signs of our understanding of the Trinity also in Paul today. He talks about the Spirit giving many and various gifts, the many and various services we do in Christ’s name, and the activities we carry out in God’s name. But it is one God activating everything. If we are one body in Christ, the Spirit is our life blood coursing through that body to give life and strength to all the limbs. So the importance of Pentecost for us today is more than just a birthday; it should be a reminder of our unity through the Trinity and through the workings of the Three Persons in One. Being part of that one body, we should not distinguish any member or part of that body being better than any other member. That is why Paul ends with “we were all baptized into one body – Jews or Greek, slaves or free. Arguments about priests being better than lay people, men better than women, rich better than poor, different better than same – should have no place in a Christian’s heart. The Spirit unifies us all. And though we may play different parts, just as the function of the heart is different from that of the right arm, we all work together for the wholeness of the body, and we celebrate the health of each part, since it all affects us in some way. This way of thinking is a different paradigm than we have in modern society. Can we bring our Christian paradigm to the forefront of our own lives, and convince others by our love and care to do the same. That is the challenge of Christians today, and it all began at Pentecost – the Good News that we celebrate at the end of our Easter season. “Men of Galilee, why are you standing there looking up into the sky?“ Imagine, Jesus’ disciples have just gone through a very rough time having seen Jesus taken away, crucified and resurrected back to life. Their whole internal being has been set on edge and they have slowly recovered when Jesus is taken up into the clouds and is gone. 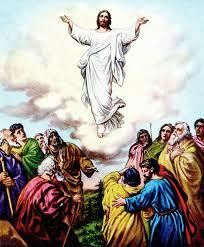 With all his appearances, he prepared them for the Holy Spirit and enjoined them to remain in Jerusalem until he came. At the same time he charged them to go out to the whole world and witness to him. For three years he prepared them to go out and witness to him. But imagine, go to the whole world. In that time the world was perceived as being relatively small. How far would the average person go in that time when the means of travel was basically on foot or on the back of some animal. Convert the whole world, preach to every person, imagine how impossible that would sound. Even today, has the word and witness to Jesus, got out and reached all the ends of the earth. Obviously then Jesus work is not yet done and even today we are called to witness to him in every way possible reaching out, being Christ like, and making him present through our own life. Very few people are gifted to be great orator or preachers or stand out as a special witness inspired by the Spirit and Christ’s presence. In actuality, witness to Jesus is a slow and tedious process of living our life and letting Christ’s presence be seen in the way we conduct our selves and share our faith and the love of Christ and his Spirit. In community in our churches Christ is present and acts among us, but the non-believers, the ones needing to be informed and witnessed to are out beyond the walls in the so called highways and byways. The Spirit moves as he wants, but our witness is what we do and how we act, how we love and witness Christ’s name. I think we can really witness to one person at a time reaching out to others one by one. How well we witness that way will hopefully bring Christ’s presence and the action of his spirit. So Christ calls us to act, to witness, to let our presence bring forth his presence and hopefully bing others to believe. Jesus will return, but we are forewarned not to be idle .